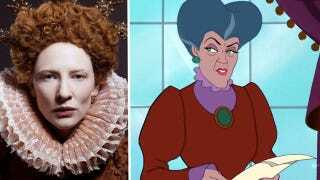 Cate Blanchett is the first potential member of Mark Romanek's live-action Cinderella movie. Yes, we said motherfucking Mark Romanek! So yes, this could finally be the super-dark fairy tale we've all been waiting for... as long as Disney doesn't muck it up. You may recall Romaneck as the director of One Hour Photo, Never Let Me Go, the awesome Locke & Key pilot, and countless awesome music videos, which should explain why we're so excited for this as-yet untitled adaptation of Cinderella, scripted by Chris Weitz (About a Boy). The Wrap is reporting that Blanchett is currently in negotiations to star as the head villain, which would only make the movie more awesome. Fingers crossed the negotiations go off without a hitch. With all of these amazing women being cast as evil fairy tale villains (Angelina Jolie as Maleficent, Charlize Theron as Ravenna, Julia Roberts as the hornier version of Snow White's stepmom) are we rapidly approaching an Avengers-style villain team-up movie? Aaaaand now I have to go sit in the corner and think about that for the rest of the day.